↑ अ आ इ Gutas, Dimitri (1998). 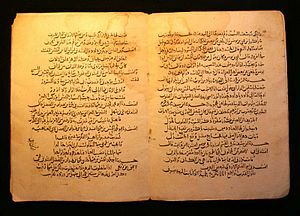 Greek thought, Arabic culture : the Graeco-Arabic translation movement in Baghdad and early ʻAbbāsid society (2nd-4th/8th-10th centuries). London: Routledge. पपृ॰ 53–60. OCLC 70768786. आई॰ऍस॰बी॰ऍन॰ 9781134926350. ↑ अ आ इ ई Al-Khalili, Jim. 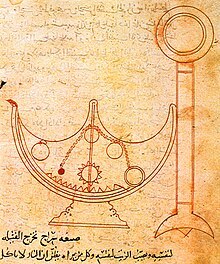 The House of Wisdom : How Arabic Science Saved Ancient Knowledge and Gave Us the Renaissance. New York : Penguin Press, 2011. ↑ अ आ Lyons, Jonathan (2014). "Bayt al-Hikmah". प्रकाशित Kalin, Ibrahim. The Oxford Encyclopedia of Philosophy, Science, and Technology in Islam. Oxford: Oxford University Press. ↑ अ आ Brentjes, Sonja; Morrison, Robert G. (2010). "The Sciences in Islamic Societies". The New Cambridge History of Islam. 4. Cambridge: Cambridge University Press. पृ॰ 569. ↑ अ आ इ ई Pormann, Peter E.; Savage-Smith, Emilie (2007). 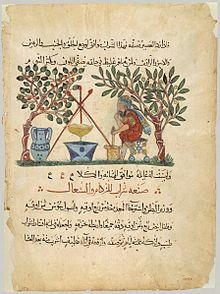 Medieval Islamic medicine. Washington, D.C.: Georgetown University Press. पपृ॰ 20–29. OCLC 71581787. आई॰ऍस॰बी॰ऍन॰ 9781589011601. ↑ अ आ इ ई Lyons, Jonathan (2009). 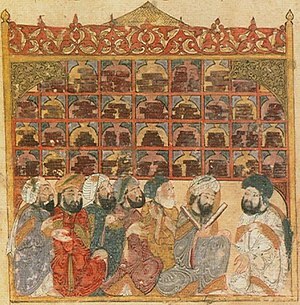 The house of wisdom : how the Arabs transformed Western civilization. New York: Bloomsbury Press. आई॰ऍस॰बी॰ऍन॰ 9781596914599. ↑ Angelo, Joseph (2009). Encyclopedia of Space and Astronomy. पृ॰ 78. आई॰ऍस॰बी॰ऍन॰ 9781438110189. 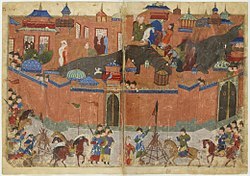 ↑ "The Mongol Invasion and the Destruction of Baghdad". Lost Islamic History. ↑ Adamson, London Peter The Great Medieval Thinkers: Al-Kindi Oxford University Press, New York, 2007, p. 6. London Peter Adamson is a Lecturer in Late Ancient Philosophy at King's College. ↑ A. B. Arndt (December 1983). 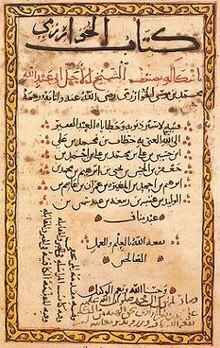 "Al-Khwarizmi". The Mathematics Teacher. 76 (9): 668. ↑ John L. Esposito (6 April 2000). The Oxford History of Islam. Oxford University Press. पृ॰ 160. आई॰ऍस॰बी॰ऍन॰ 978-0-19-988041-6. ↑ La Maison de Sagesse Archived 2016-12-18 at the वेबैक मशीन. ↑ "PRIX INTERNATIONAL MÉMOIRE POUR LA DÉMOCRATIE ET LA PAIX 2016 : La Maison de la Sagesse présélectionnée | Le Mauricien". www.lemauricien.com (फ़्रेंच में). अभिगमन तिथि 2017-09-13.